Prasat Preah Vihear has the most spectacular setting of all the temples built during the six-centuries-long Khmer Empire with a view for many miles over the plains of North Cambodia. As a key edifice of the empire's spiritual life, it was supported and modified by successive kings and so bears elements of several architectural styles. Preah Vihear is unusual among Khmer temples in being constructed along a long north-south axis, rather than having the conventional rectangular plan with orientation toward the east. The temple gives its name to Cambodia's Preah Vihear province, in which it is now located, as well as the Khao Phra Wihan National Park which borders it in Thailand's Sisaket province and through which the temple is most easily accessible. On July 7, 2008, Preah Vihear was listed as a UNESCO World Heritage Site. 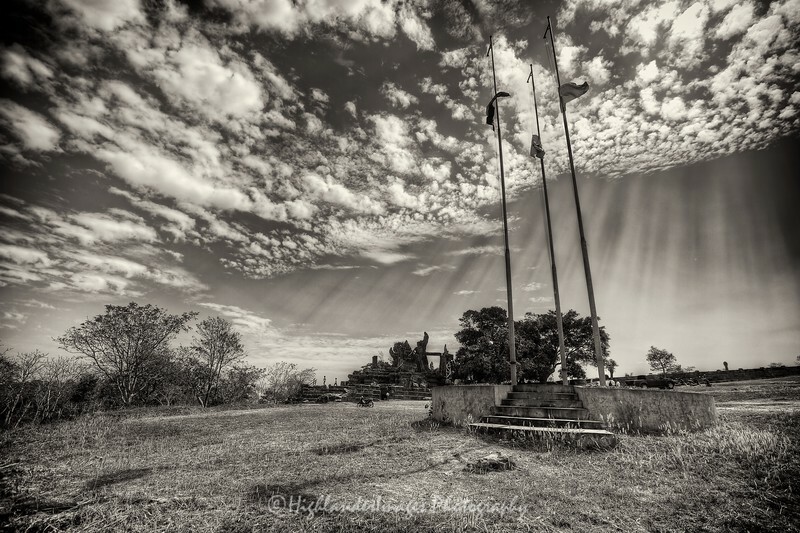 This is a unique set of high quality, black & white prints of Preah Vihear, "Temple in the Clouds", Cambodia printed in either MetalPrint high gloss or MetalPrint satin finish and in a variety of sizes. This set of high quality prints have been priced as a special package as a set of 4 and would make an exceptional framed series for the collector.